Those who new to LINQ to SQL, it is a database development model in the context of an Object Oriented Programming Model. LINQ is a broad topic. If you need to know more about LINQ, there lots of great articles in the web including some excellent sources from MSDN. .NET Framework 4.0 has also made significant enhancements to its LINQ model. This includes improvements to areas such as performances, query stabality, usability, LINQ to SQL class designer and much more. You can find some of those improvement in here. Take a look at this article on LINQ to SQL Debug Visualizer, which explains how it is integrated and used within Visual Studio. VS LINQ to SQL Debug Visualizer has its own limitations to it. For example it does not diplay the complete query. It is hard to edit and execute while debugging. This article discribe some of the limitations. I think this is an excellent tool to write and test your LINQ queries. 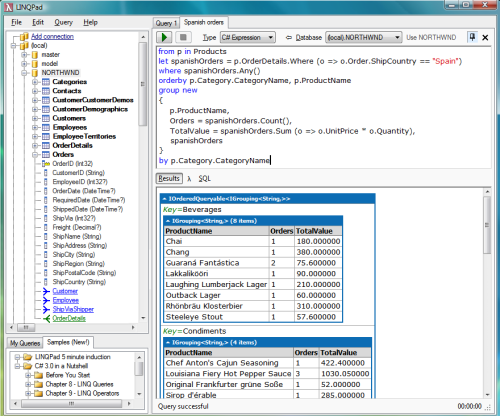 It is a great tool to help you build any type of queries with LINQ. Standard edition is free and I recon every developer should have it. You save lot of time by having these tools which allows you to be more productive when writng queries. You can also connect to a SQL Server DB (Express or Compact Edition) and with a connection to your LINQ Data component (if you have built one) you can perform queries right against your data with LINQ – that’s excellent! The standard edition is free to download and it supports .NET 4.0 as well. Standard edition does not have the Autocompletion feature. For more information on Autocompletion please click here. More importantly it is a great tool to learn and improve your skills on LINQ to SQL.